On the left, an analogous colorway using yellow-green, green, blue-green, and violet. On the right, a split-complementary scheme using blue-green, red, and orange. In the last blog post, I offered some of my favorite "pro tips" on color management in spinning, culled from what I consider to be the best sources available on the subject. Today we dive deeper, as I talk about using a color wheel to suss out color harmonies, or color combinations known for yielding pleasing results, in the braid you want to spin. If you'd like an easily digestible lesson in understanding the principles behind the color wheel (and so much more), I recommend Felicia Lo's book, Dyeing to Spin and Knit. Once you know a bit of color theory and understand how a color wheel works, then you can better decide what you'd like to achieve with the fiber you've got before you. If, as in the photo on the left above, the colors are analogous, or side by side on the color wheel, then you're in luck. These colors will play well together no matter how you'd like to spin and ply your fiber. Your next decision is whether you'd like to preserve the brightness of the colors, their order in the fiber itself, etc. Anything will work, even a fun barber pole effect. Your colors will not muddy. Don't write off or destash an overly-exuberant (loud) braid of fiber. Instead, spin it fractally, or even as a traditional 3-ply. The results will be a much more muted version of the colors in the original fiber and a highly knittable yarn. You won't believe the difference! Consider bringing a solid color to the mix, if you have one on hand. 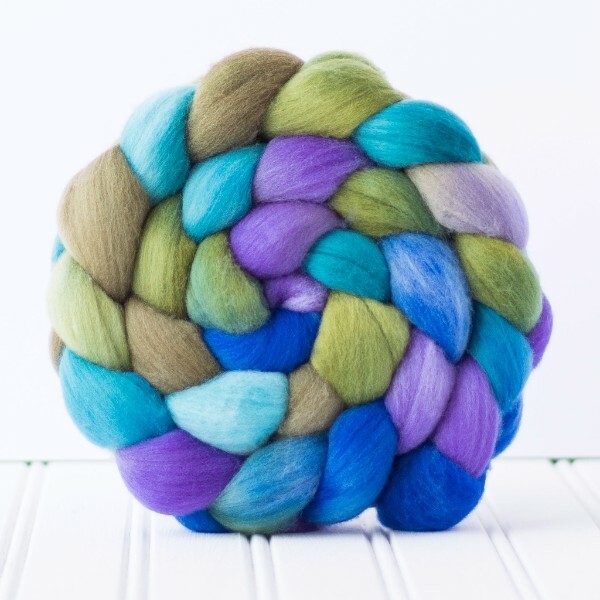 Whether it's black to deepen the tone, white to brighten, or a color similar or even complementary to what's in the fiber bump itself, you can completely transform your end results with this oh-so-simple addition to your spin. The options are truly endless when it comes to spinning and using the color wheel and color harmonies as your guide, and knowledge is power, as they say. Learning more about color harmonies is a terrific way to become a more purposeful spinner!